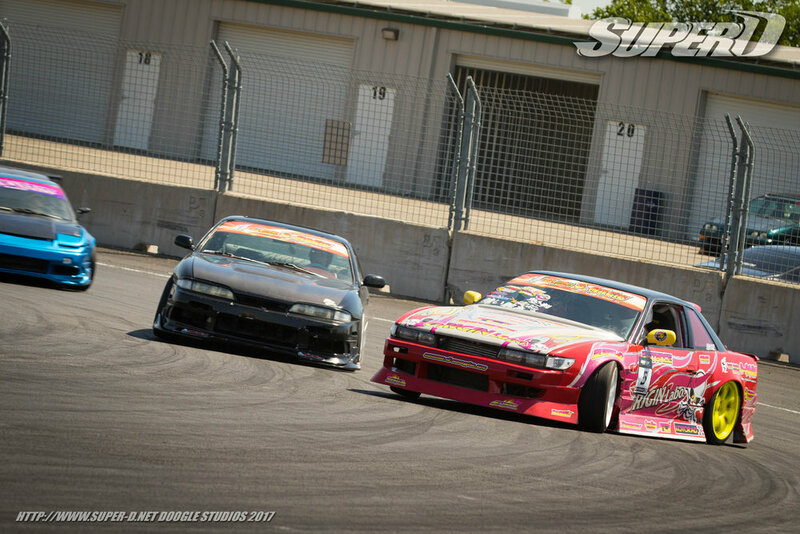 Super D Cup Round 2 took place at Thunderhill Raceway Park on May 28th, 2017. The course layout featured a replica of Tokushima Kart Land, where the main focus is a high speed entry against a wall of tires into a tight hairpin. Line choice and commitment to the entry right in front of the judges are the major keys to an exciting run. A field of over 30 drivers took to the skid pad to do battle in the 90+ degree weather on an otherwise beautiful Sunday in Northern California. With Round 2 being a familiar course for most, it did not take long for drivers to start throwing down aggressive runs. Judges had their work cut out for them as the entire field seemed to have elevated their skill since Round 1. The Qualifying/Practice session proved to be just as exciting as the top 16! Due to the nature of the course layout, the drivers' grid was located on the North side of the skid pad while the entrance to the pits was on the South side, across the course. Thanks to our track staff for their smooth and safe operation of the grid! The opening battle of the Top 16 featured Gary from Realize versus Taichi Kasahara. Both drivers delivered a solid first run, but on the second run Gary spun his straight six powered S13 handing the victory to Taichi and his V6 hatch. Battle number two saw Kodi Rosado of Broken Aero versus Al Pulido of Animal Style. Once again both drivers threw down on the first run with Al leading Kodi. 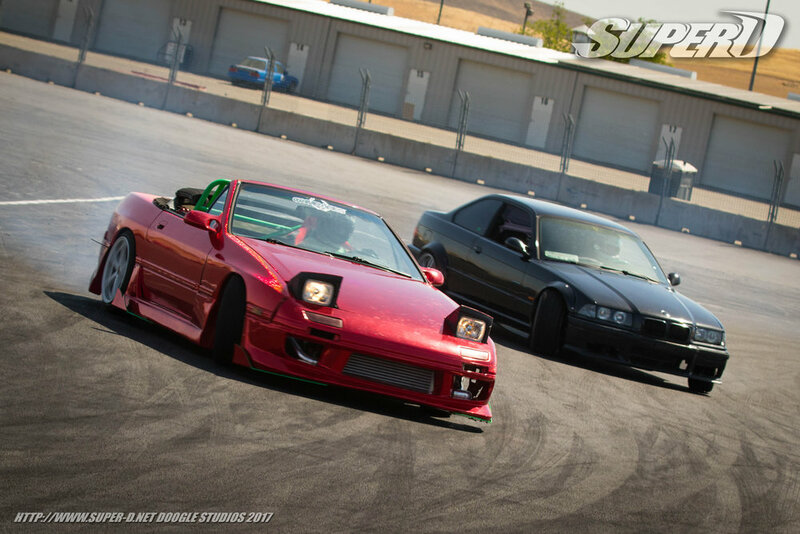 Al's chase run was looking solid until a mechanical failure caused his SR powered 240sx to stall in the hairpin, giving the win to Kodi and his BMW faced S13 coupe. Sometimes when two drivers are pushing hard things don't always work out smoothly. Roy Cardoso and Aaron Wong gave us a perfect example of this in their Top 16 battle, where the two cars made contact sending the rear end of Roy's KA 240sx flying over the hood of Aarons 1JZ 240sx. The contact was ruled a racing incident with Aaron ultimately becoming the victor. At the halfway point we saw Leo Goldin in his E30 take on Julian Dumay in the S12. Julian was at a slight disadvantage after breaking his second gear, but a mistake by Leo in his chase run gave the victory to Julian in his wounded S12. 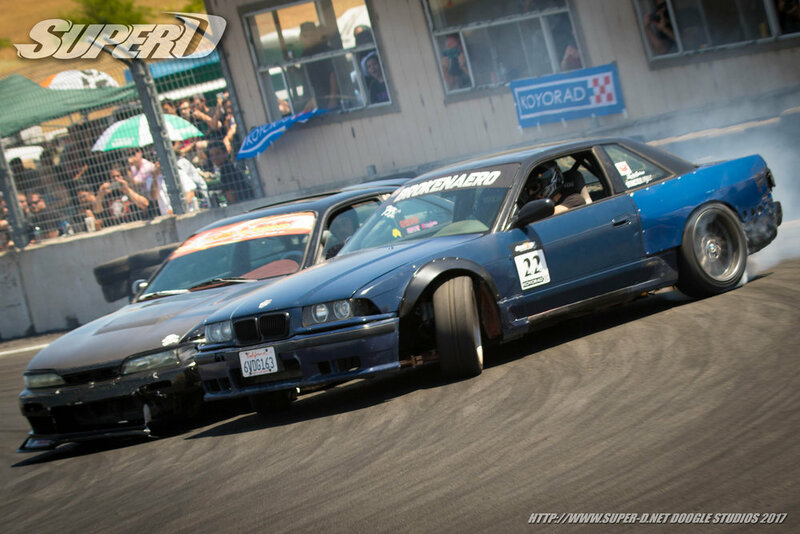 Tandem drifting is hard enough as it is, but throw in the pressure of competition and a diverse field of cars and its a whole different animal. In the battle of Dominic Sacco versus Matt Madrigali, Dom overestimated the speed of the Formula Drift pro in front of him giving his Z32 a bit of a makeover after making hard contact with Matt's 240sx hatch. The second run was clean from both drivers and it was Matt with the win. 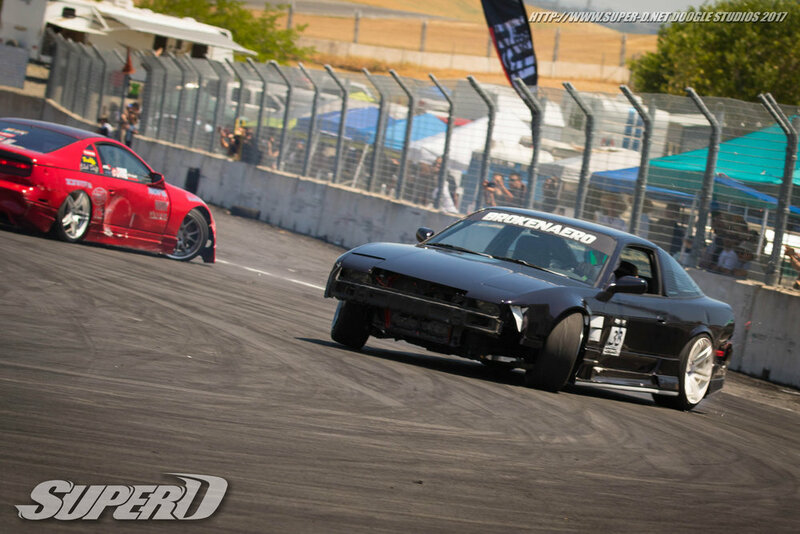 Lexis King in his turbo FC faced off against Xander Newell in his 180sx face S14. Xander went off course in his chase run giving Lex a huge advantage. After a clean second run it was Lex who would be advancing. The second to last battle of Top 16 featured the hot-boys Julian Jacobs and Earl Buenavente. Both runs were clean, and in the chase Julian glued his KA-powered S14 to the door of Earls sparkling FC RX7 to earn the victory. The final Top 16 battle featured heavy hitters Chris Hillis and Jason Bostrom. Both drivers were on point, but Jason's speed couldn't be matched by Chris' E36, securing Jason's win and a spot in the Top 8. Top 8 kicked off with Kodi Rosado vs Taichi Kasahara. Both runs were exciting, with the judges decision going to Kodi for staying closer in his chase run. The most intense battle of the Top 8 was between Animal Style teammates Julian Jacobs and Jason Bostrom. After multiple one-more-time calls, Jason finally made a couple small mistakes giving the win to Julian. In the second battle we saw Aaron Wong face off against Julian Dumay. After a correction in his lead run, Aaron sent his 240sx off course handing the win to the smooth and steady S12 of Julian. The final battle of Top 8 featured old rivals Matt Madrigali and Lex King. Both drivers were charging hard, but it was Lex who was able to stick his FC to the door of Matt's 240sx to take the last spot in the Top 4. Top 4 started off with a battle of teammates between Kodi Rosado and Julian Dumay of Broken Aero. Julian delivered a solid lead run despite missing second gear, with Kodi hot on his tail. In the lead Kodi maintained a gap on Julian earning himself the victory. In another exciting match we saw a repeat from round one of Lex King versus Julian Jacobs. Lex chased first and kept his FC close to Julian's s14. Chasing up the hill Julian mis-shifted, creating a gap between the cars. Lucky for him, Lex over-rotated into the hairpin and lucky for Lex, Julian was right there to bump him back into his line forcing a sudden death battle. In the second set of runs Julian led with an aggressive entry, Lex matched the speed but went off course. With the roles reversed Julian mirrored Lex and was awarded the victory. The consolation battle featured Lex King and Julian Dumay, who were both on a mission for their first Super D podium. Lex and his FC were on point and proved to be just a bit too much for Julian, putting an end to an impressive drive in his injured machine. The top spot on the podium was up for grabs in the final battle of Julian Jacobs versus Kodi Rosado. In the lead Julian put down an aggressive lap, and by the end of the hairpin Kodi was on his door. Kodi also put down an exciting lead run but Julian was all over him from start to finish, winning over the judges and securing first place in Super D Cup Round 2! With back to back round wins Julian Jacobs leads the points standings and carries an undefeated record in battle. Will anyone be able to take the crown away from him at Round 3? We sure can't wait to find out! Thank you to everybody who came to the event, and to everybody who supports Super D! See you at Round 3!